A Work In Progress: Professor Frink makes his first appearance, peddling a planned death ray to Grampa in the hopes of getting a share of his inheritance. Grampa's first name is revealed to be Abraham. 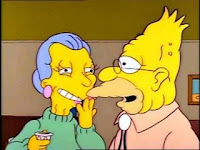 Matt Groening, who had named most of the main characters after members of his family, refused to name Grampa Simpson after his own grandfather, so he left it to the show's writers to pick a name for the cantankerous Simpson. They picked Abraham, not realizing this was also Groening's grandfather's name. Fun Fact: The closing credits of this episode list the voice actors alongside the characters they play, the first and only time this has happened, to date. Bart: You know, Grampa kinda smells like that trunk in the garage where the bottom's all wet. Lisa: Nuh-uh, he smells more like a photo lab. Homer: Stop it, both of you! 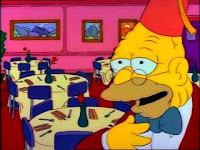 Grampa smells like a regular old man, which is more like a hallway in a hospital. Frink: With proper funding, I'm confident this little baby could destroy an area the size of New York City. Grampa: Put it all on 41. I've got a feeling about that number. Roulette man: The wheel only goes to 36. Grampa: Okay, put it all on 36. I've got a feeling about that number. Teebore's Take: The first Grampa-centric episode is pretty meh; that's two average episodes in a row. "Old Money" has its moments, but is far too sappy. It makes some good points about the devaluing of the elderly by society, but doesn't say anything remarkable or groundbreaking about it. The scene in which Grampa listens to pitches from people that want the inheritance he received is the highlight, especially Lisa's impassioned plea that the people who deserve the money most are the homeless and families struggling to make ends meet, followed by her request for a pony. Not a bad episode, but not too memorable either. 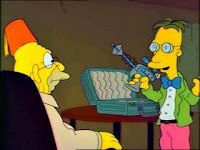 I suppose it gets a point for being the first Grampa episode, and for introducing Professor Frink, peddling a death ray, no less.